The only Irishman ever to be deported by the Irish Government – Jim Gralton, the famous Leitrim socialist – will form the subject of Ken Loach’s new film, set to start filming in Leitrim this summer, with funding by the Irish Film Board. 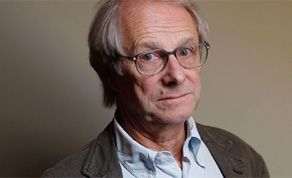 The film will be set a decade after the events of Mr Loach’s last Irish historical drama ‘The Wind that Shakes the Barley’ – about the Irish War of Independence and Civil War – which won the Palme d’Or at the Cannes Film Festival in 2006. Produced by Sixteen Films’ Rebecca O’Brien and Element Pictures, ‘Jimmy’s Hall’ will be based on a screenplay by Mr Loach and Paul Laverty – inspired by Donal O’Kelly’s play ‘Jimmy Gralton’s Dancehall’. Deported in 1933 by de Valera’s Government for his alleged communist sympathies, Jimmy Gralton was politically active during the War of Independence and, in the 1920s, erected a meeting hall on his parents’ land – the ‘Pearse-Connolly Hall in honour of the Socialist and Republican leaders of 1916’. This hall became a focal point for Gralton’s political activities, which provoked the opposition of local clergy, who became determined to have him arrested. In the years that followed, Gralton became a member of the Revolutionary Workers Group, spoke at anti-eviction meetings and meetings of the National Unemployed Movement. He was a high-profile casualty of the ‘Red Scare’ that swept through Ireland during the January 1933 general election, which resulted in the new Fianna Fáil Government issuing Gralton’s deportation order as ‘an undesirable alien’. Gralton lived out the rest of his days in the US, joining the American Labour Movement and running as a candidate for the Communist Party in the Borough elections in Manhattan before his death in New York in 1945. Mr Loach and his production team visited Leitrim last week to scout filming locations for the upcoming shoot. 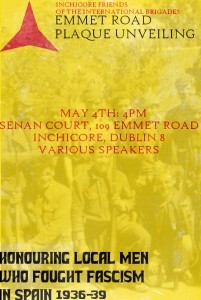 Saturday 4th May @ 4:00pm, at Senan Court, 109 Emmet Road, Inchicore, Dublin 8 (opposite Bulfin Road). 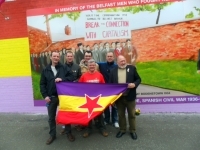 The Inchicore Friends of the International Brigades are erecting a plaque to the memory of six local men who went to Spain to defend the Spanish Republic against the military coup of July 1936. 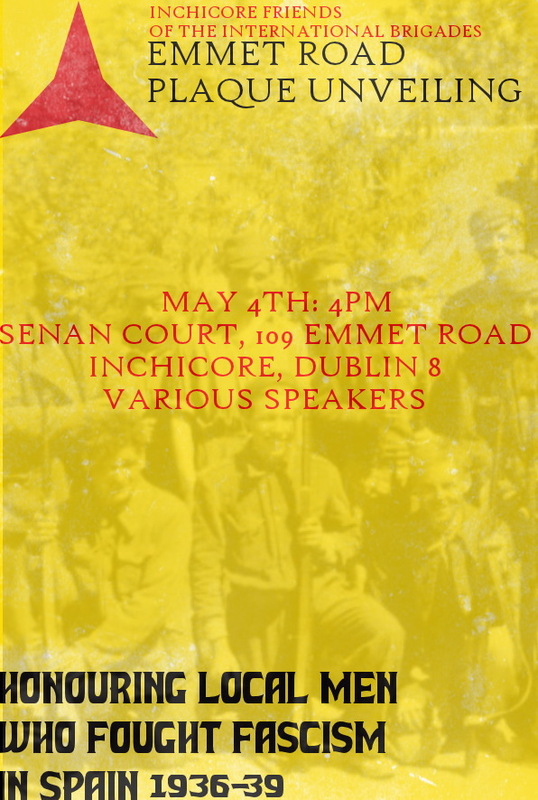 The Inchicore Friends of the International Brigades is a local group dedicated to remembering those who volunteered to defend the Spanish Republic against the forces of international fascism and capital. 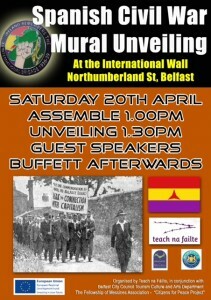 As part of the Friends of the International Brigades in Ireland (FIBI), the group is affiliated with the International Brigades Memorial Trust. Future projects include the erection of a memorial to Jim Prendergast in Temple Bar in September 2013 and the continuation of a second-level schools’ essay competition, launched successfully in 2012. Saturday, 4th May at 2.00 p.m. in the Triskel Arts Centre, Cork City. Using British Pathe film, historical photgraphs and documents an hour long documentary on the life of Cork trade union leader, socialist and republican fighter, Tadhg Barry, will be shown in Cork on 4th May. 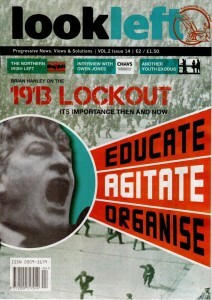 The film covers his life from his birth place on the north side of Cork City, to his early years in the work force and his initial leap into journalism, and from there to his political enlightenment and work with the ITGWU, James Connolly and James Larkin to re-build the union in Cork and to fight for Irish Freedom. 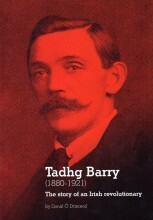 Barry was active in the 1916 Rising and the film covers his transformation from military to political activist when he became an Alderman of the First Republican Council in Cork and Secretary of the ITGWU James Connolly memorial branch. Jailed on several occasions, the film of Barry’s life also incorporates the burning of Cork and his final arrest and transfer without trial to Ballykinlar internment camp in county Down where he started the first ever Trades Council in a prison environment. He was shot through the heart while waving good bye to fellow prisons sent out on release just three weeks before a general amnesty in 1921. Footage in the film shows how Michael Collins left the ‘Treaty’ talks to attend his funeral. Among the contributors to the to the film are SIPTU General Secretary, Joe O’Flynn, Tadhg Barry Galvin, great grandnephew of the late Tadhg Barry, Brenda Corcoran and other family members, Gerry White, Quarter Master and Historian with the Southern Command in Collins Barracks Cork and his biographer Dr. Donal O’Driscoill, the School of History, UCC. The film is a joint production between the Cork Council of Trade Unions and Framework Films produced by SIPTU organiser, Trevor Quinn, Eddie Noonan and Emma Bowell. 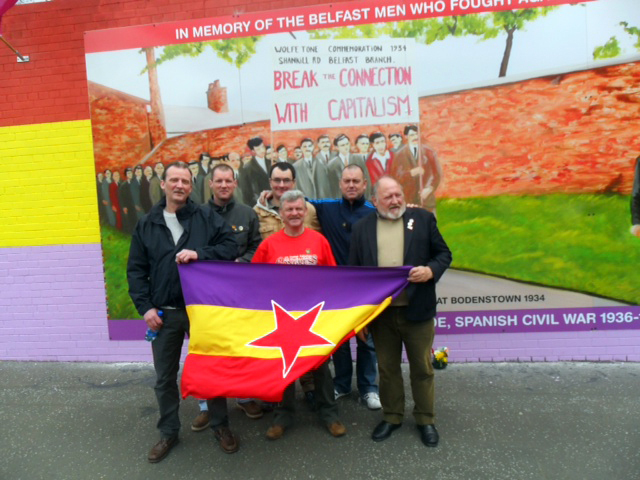 The Peter Daly Society would like to thank Teach na Fáilte for their invitation and hospitality at the recently unveiled mural to the International Brigades. 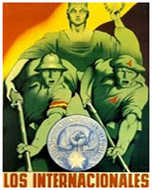 The mural depicted the image of the republican congress contingent who attempted to take part in the 1934 Bodenstown Commemoration but was attacked by nationalist elements, these working class socialists came from both the nationalist and loyalist areas of Belfast, most of these brave men made the supreme sacrifice in Spain making a heroic stand against fascism, they should never be forgotten. The remainder of the website will continue to be available in Spanish via Google Translate. 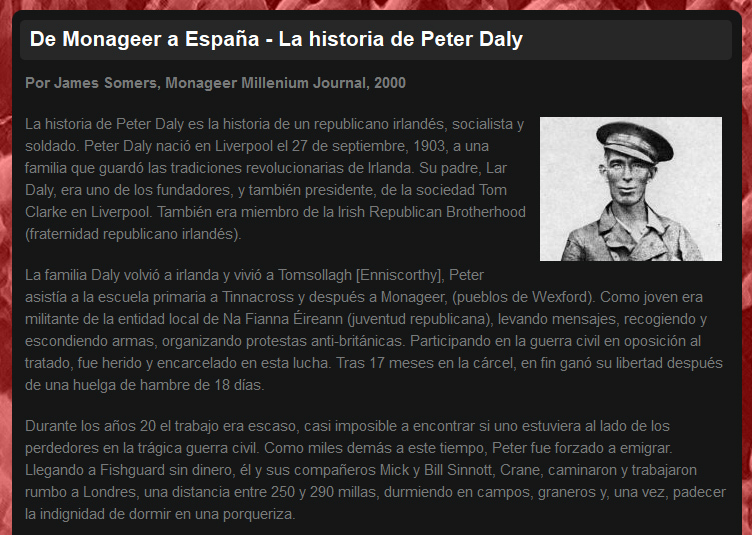 The Peter Daly Society/La Sociedad Peter Daly would like to thank Sean Edwards for providing the Spanish translation. 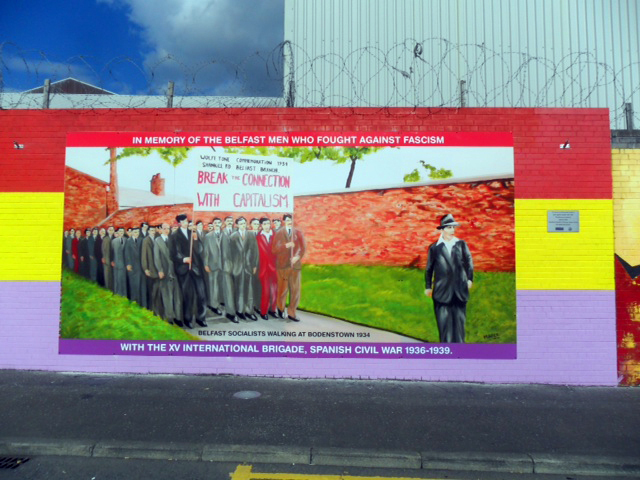 Teach na Fáilte the Republican Socialist Ex-Prisoners Support Group will be unveiling a Mural in Belfast in memory of the Belfast men who fought against Fascism with the XV International Brigade in the Spanish Civil War [1936-1939]. The Mural is situated on the International Wall on Northumberland Street adjacent to the Peace Line. 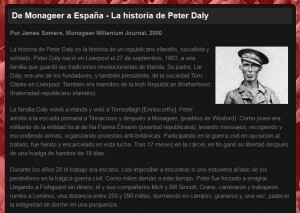 As this is the 77TH anniversary of the Spanish Civil War, Teach na Fáilte feel that it is important that these men should be remembered as people from both the Nationalist and Unionist tradition bonded together by ideology, united across the sectarian boundaries in a common cause of democracy embodied in working class politics. 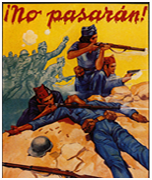 The men who volunteered to fight in Spain against Fascism are part of our working class history and no one community has the monopoly on its remembrance so the main objective is to forge a common bond and establish a sense of pride in their endeavours and whose ideology knew no sectarian barriers. 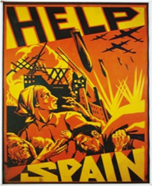 Belfast during that period had its own share of trouble with a background of Outdoor Relief Riots, Unemployment and Depression but these issues became a unifying factor with these Volunteers as they made the decision to go to Spain to fight Fascism. Unbeknown to them at the time, their stand was to be widely recognised and believed to be the opening shots to The Second World War. 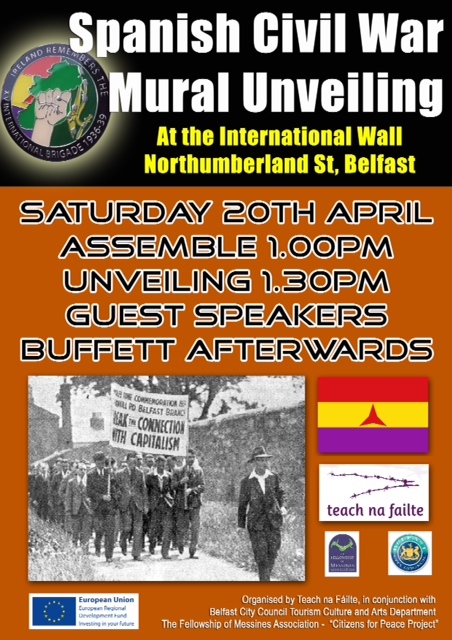 This Mural is just another Project that Teach na Fáilte, who along with other Groups, have been involved in around the Spanish Civil War with the erection of marble plaques to volunteers from both sides of the community followed by Memorial Lectures on their lives and ideals. Members of Tnf have also travelled to the Battlefield at Jarama outside Madrid and met with some surviving Brigadistas from other countries. Teach na Fáilte have had a specially designed badge to commemorate the unveiling of the Mural and will have a buffet laid on afterwards to accommodate all those attending. Large-scale confrontations, disruption of meetings, sabotage and street fighting have been part of the practice of anti-fascism from the early twentieth century until the twenty-first. Rarely endorsed by any political party, the use of collective bodily strength remains a strategy of activists working in alliances and coalitions against fascism. In Physical Resistance famous battles against fascists, from the Olympia arena, Earls Court in 1934 and Cable Street in 1936 to Southall in 1978 and Bradford 2010, are told through the voices of participants. 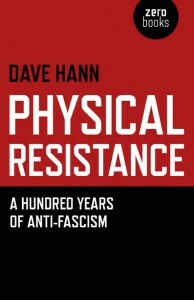 Anarchists, communists and socialists who belonged to a shifting series of anti-fascist organizations relate well-known events alongside many forgotten but significant episodes. The Abortion Rights Campaign – the struggle for reproductive rights. 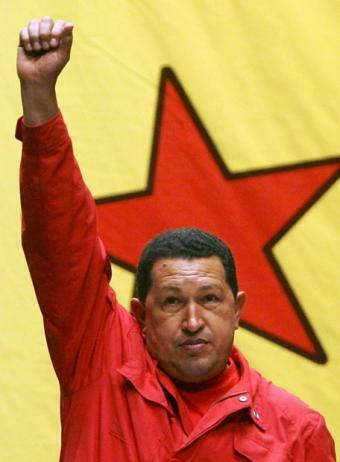 With profound regret the Peter Daly Society learns of the death of Hugo Chávez, president of Venezuela and leader of the Bolivarian Revolution. We extend our sympathy to the Venezuelan people on the loss of their leader, and we reaffirm our unbreakable solidarity with the Venezuelan Revolution. Members of the public are invited to sign the book of condolences at James Connolly House (43 East Essex Street).